A benefit exhibit and sale for artist Diane K. Rath has been organized by Vermont Artisan Designs (106 Main St., Brattleboro) for the month of March. 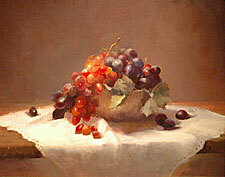 Works by Rath (including two of her trademark peony paintings) and those of a number of her friends and former students -- including members of the local Putney Painters and the High Street Painters, as well as others from Illinois, Michigan, Florida, Massachusetts, New Hampshire, and Connecticut -- will be on display beginning on Gallery Walk, March 4. Besides Rath, participating artists include Nancy Guzik, Toby Young, Deborah Lazar, Andrea Scheidler, Kathy Anderson, Robert Watkins, John D. Smith, Rosemary Ladd, Rick Hearne, Linn Bower, Nancy Calicchio, Lesley Heathcote, Mimi Wiggin, Diane Farr, Charlotte Arnold, Marci Oleszkiewicz, Tatiana Yanovsky Sink, Loretta Yoder, and Judith Greulich. And more are expected throughout the month. Most of the proceeds of the sale will go toward Rath's medical expenses. Early this year, she was diagnosed with colon cancer and has no medical insurance. "The support for this show and for Diane has been growing over the past few weeks and is a testament to her effect on people as an artist and a friend," shared Greg Worden of Vermont Artisan Designs. 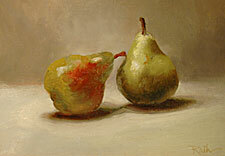 Rath has taught a number of painting workshops in the area over the past several years. "Many of Diane's students credit her with teaching them how to love life, as well as how to paint, through her kindness and enthusiasm for their individual artistic journeys." Diane Rath has been creating art her entire life. Following her early training with Merrenda and Gordon Keyte, she completed two degrees and post-graduate studies at the American Academy of Art. Since then, she has continued to study the highly refined painting and teaching techniques of renowned artists including Richard Schmid, David Leffel, Harley Brown, and Gregg Kreutz in numerous workshops. For over 20 years Diane has been perfecting her painting and teaching skills as a working artist and an instructor of oil painting at the American Academy of Art and the prestigious Palette & Chisel Academy of Fine Arts in Chicago. She has also presented workshops in still life, portraiture, and landscape in many of the United States, including Vermont, and in San Miguel de Allende, Mexico. Diane's art work has been shown in many group exhibitions and six one-woman shows. Her skill as a painter has been recognized through numerous awards, competitions, and featured magazine articles. Her oil paintings continue to find homes all over the country as she paints from her studio in Lake Bluff, Illinois. Information about the show in Brattleboro may be found on the Vermont Artisan Designs Facebook page. 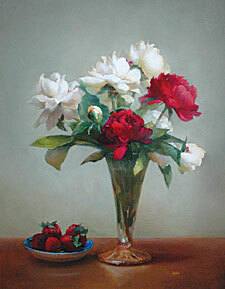 Additionally, two websites -- www.PeoniesforDiane.com and www.dianerath.com -- feature more information about the artist. In addition to the benefit for Rath, three-dimensional work (pottery and sculpture) by area public and private high school students will be shown at Vermont Artisan Designs as part of Student Art Month, sponsored by the Arts Council of Windham County; and colorful landscapes by Anne Cady of New Haven, Vermont, also will be exhibited.